The pretty little Crown View was doomed from the start. It was new production of old technology, and was quickly eclipsed by its new stable mate, the Graphic View. The Folmer Graflex Corporation began production of the Graphic View in 1941 (maybe '40, depending on authority). Its modern engineering and appearance consigned the poor Crown View to oblivion after a short production run. Actually, it is unfair to compare these two cameras. The Crown View was less flexible but much more portable. For whatever reasons, Folmer Graflex did not want to manufacture both of them. It would have been competing with itself, and the Crown View already had some other contemporary competitors. 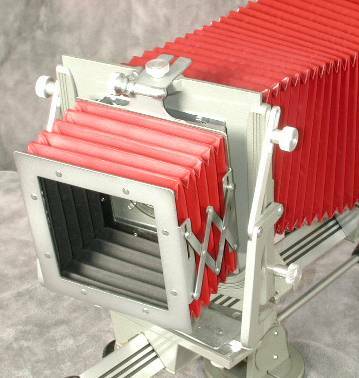 This new Graphic View had no real competition, and Graflex was able to sell it for $97.50 in 1941. 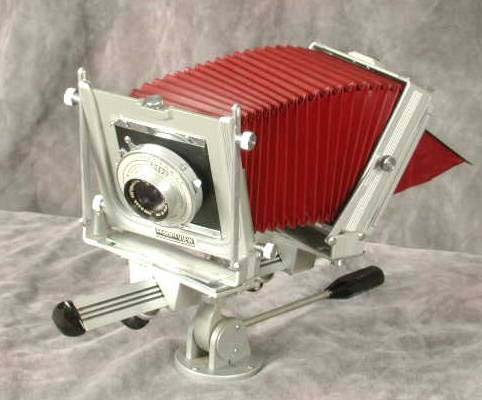 While it does not have the classic beauty of the wooden view camera, the Graphic View is very attractive itself, in an art deco way. The red bellows and the inverted-V rail are distinctive. The camera sold and sold well. The Graphic View is a monorail design. The inverted-V monorail is made of an aluminum alloy, with a rack and pinion focusing mechanism hidden under the rail. 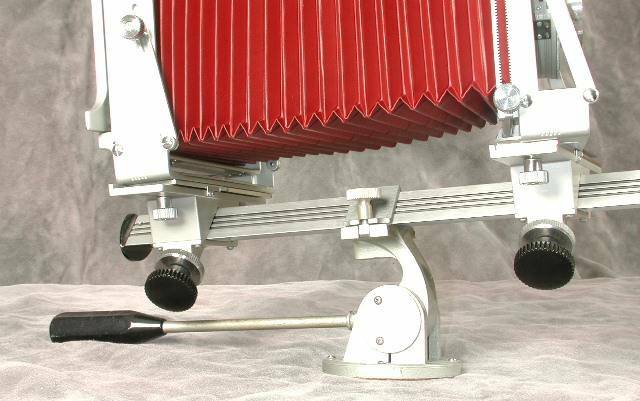 The camera attaches to a tripod with a Graflex-made tripod head. In fact, without that tripod head, the camera is useless. A machinist can make an adapter that fits the rail, but it may be less expensive just to find and buy a complete beater camera to get its tripod head. That means that when you are looking for a Graphic View (or View II, since it uses the same setup), you should be sure that the tripod head is included. The tripod head apparently was sold as an accessory at first. Were they hand-holding the camera?!? Later, the tripod head was included with each Graphic View and View II. The Graphic View and View II came with a really useful carrying case. It was made from a mysterious material called "Vulcanoid." The camera is securely held inverted in the case along with just about anything you may need for a shoot. It is useful for that purpose today. If you are shooting within easy walking distance of your car, the View or View II can be carried to the location in the secure, protective Vulcanoid case. You can easily carry the movements of a true view camera to the location. The Graphic View has more movements than the average field camera at a fraction of the cost. Save that little field camera for situations when you really need portability at the cost of flexibility. As you know, all the camera does is connect the lens with the film holder. The ubiquitous Graphic View cameras do a fine job of connecting. Focus is by moving either standard with two knobs that are connected to the rack and pinion mechanism hidden under the V. Focus lock was by a lever under each knob, but collars that are tightened to lock the knobs soon replaced the original levers. The top of the front standard has an accessory attachment point for a bellows lens hood, shown below on a Graphic View II. The lens hood is hard to find now and can cost half as much as an entire camera. It is really pretty for display, but a hat held in your non-release hand is much less trouble, very effective, less expensive and easier to carry. The accessory mount on top of the front standard can also hold an accessory bracket for a Graflite flash. The flash is held sideways. The attachment point is essentially a screw and its hole. The screw is often missing in used cameras. Unless you want to mount an accessory or find the empty screw hole objectionable, the loss of the screw is not too serious. The Graphic View camera has base tilts on both standards. The front standard has rise and fall (3 5/8") by operation of a locking rack and pinion mechanism. Both standards shift 5/8" either way, and tilt 26 degrees either way. Both standards also swing 12 degrees. Maximum bellows extension is 12". Minimum extension is 3 1/2" which may be reduced by using that recessed lens board. The movements have a centering notch. With tilt and swing, the standards are parallel when at the extremes of their movement. The rear standard has a spirit level and clips for a dark cloth. As with the Crown View, the landscape/portrait orientation is easily changed by removing the back and reattaching it in the proper orientation. 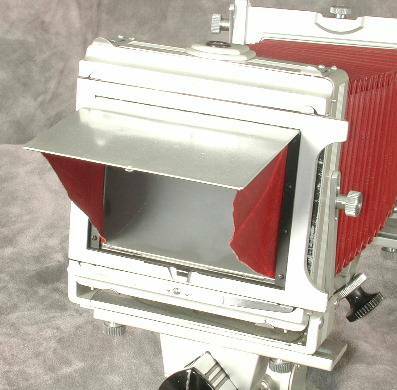 The camera came with either a Graflex or Graphic back, and 3 1/4" x 4 1/4" reducing backs were available in either Graphic or Graflex configuration. The Graphic View was never available with a Graflok back, even though the Graflok back was introduced on Pacemaker cameras before production of the Graphic View ceased. Nonetheless, you often find Graphic View cameras with retrofitted Graflok backs. You cannot distinguish Graphic View and Graphic View II cameras by looking at the back. 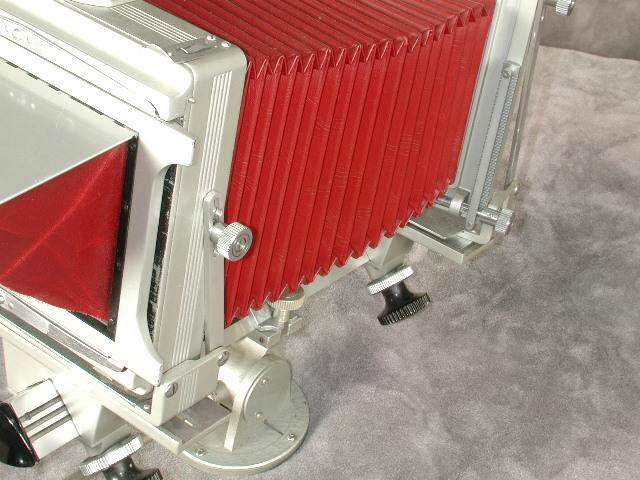 Both cameras were available with either Graflex or Graphic backs. The backs can be mixed and matched.